The potential of binary mixtures of propylene glycol–water, ethanol–water, and polyethylene glycol 400–water to cause skeletal muscle damage (myotoxicity) following intramuscular injection was examined with an in vitro model using the isolated rat muscle. At moderate concentrations (20–40%, v/v) of the organic cosolvent, the order of myotoxicity was propylene glycol > ethanol ≫ polyethylene glycol 400. The in vitro results were then compared with in vivo toxicity in rabbits after injection of normal saline, 40% (v/v) polyethylene glycol 400, 40% (v/v) propylene glycol, indocyanine green in normal saline, and indocyanine green in 40% (v/v) propylene glycol. Employing the area under the creatine kinase activity curve from 0 to 72 hr as the index of skeletal muscle damage, an excellent in vitro–in vivo correlation was observed. The basic myotoxicity relationships obtained from the binary cosolvent systems were then used to examine the myotoxicity of ternary organic cosolvent mixtures. Several mixed solvent systems with the same theoretical molar solubilization power for a model compound, diazepam, were selected to determine (1) if myotoxicity can be reduced by changing the composition of the ternary mixtures and (2) if myotoxicity of the individual components is additive. For the solvent systems containing propylene glycol, ethanol, and water, the total myotoxicity equaled the sum of the individual myotoxicity of each component. In contrast, for the solvent systems containing polyethylene glycol 400, the total myotoxicity was only half of the sum of individual toxicities. 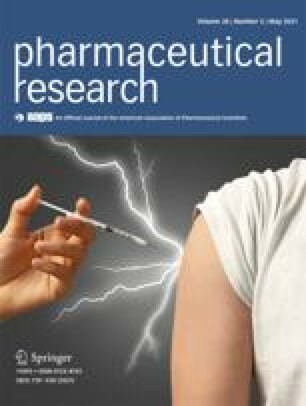 These results suggest that polyethylene glycol 400 in mixed cosolvent systems might have a protective effect on the myotoxicity generated by intramuscular injections.